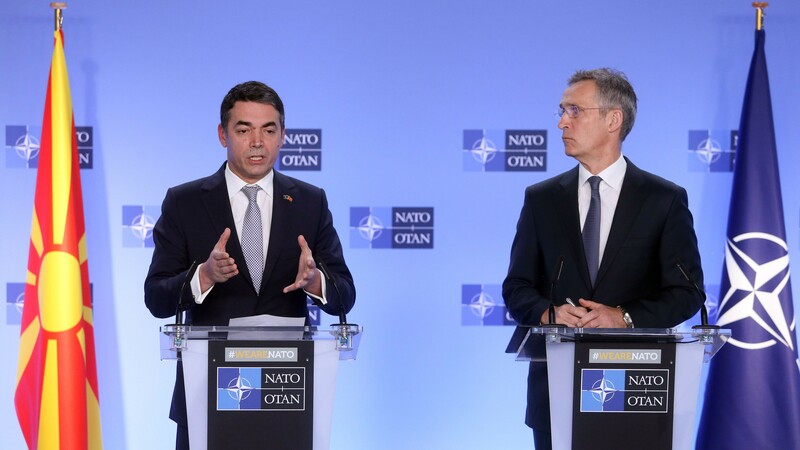 WASHINGTON — The newly-christened North Macedonia is pushing for allied nations to vote on its ascension to NATO as quickly as six months from now, as leadership seeks to finish that agreement before Russia can find ways to scuttle it. Speaking to reporters in Washington, Bujar Osmani, Macedonia’s Deputy Prime Minister in charge of European Affairs, warned that “every single day more left to the process gives a day more for those who want to hijack the process and those adversaries that would like to compromise,” Macedonia’s plans to join NATO. “I think we got the last train. This region of the world, geopolitically, is becoming very dynamic, and I think it was the last [chance] for us to define the geopolitics in the region, that this region belongs to NATO, belongs the Euro-Atlantic family of countries,” Osmani said. Osmani has reason to suspect Russia will attempt to scuttle his country joining NATO. NATO nations have identified Russia as attempting to influence a vital referendum vote in October last year, with then-U.S. Secretary of Defense Jim Mattis saying the U.S. was aiding in resistance to a cyber campaign. And in 2017, just before Montenegro was set to join NATO, a coup plot was broken up by local police; western intelligence sources identified the plot, which would have included political assassinations, as funded and organized by Moscow. Greece has held up Macedonia’s requests to join NATO and the EU for decades, as part of a demand that its northern neighbor change or modify its name to avoid any claim to the territory and ancient heritage of the region in northern Greece named Macedonia — birthplace of ancient warrior king Alexander the Great. An agreement, reached last year and surviving a number of votes in both nations, saw Macedonia change its name to North Macedonia. In exchange, Greece has agreed to end its objections to Macedonia’s joining both NATO and the European Union. To join NATO, the governing bodies of the 29 allies must ratify Macedonia’s ascension. Osmani doesn’t see any issue with the local governments, but is cognizant that the longer the process drags on, the greater the chance Russia could influence the outcome somehow. Hence, he wants to see a vote happen as quickly as within six months. That’s an ambitious timeline, given the last three countries to join NATO – Albania, Croatia and Montenegro – took between 12-18 months to line up votes. Strategically, Macedonia is hoping to get the U.S. Senate to vote in favor as soon as possible, as that would be a strong signal to other NATO members. And while President Donald Trump has been vocally critical of NATO at times, the Senate has been supportive, including a 97-2 vote last summer to ratify support for the alliance. Macedonia, which now spends around 1.2 percent of GDP on defense, has a plan in place to hit the NATO target of 2 percent GDP spending by 2024.